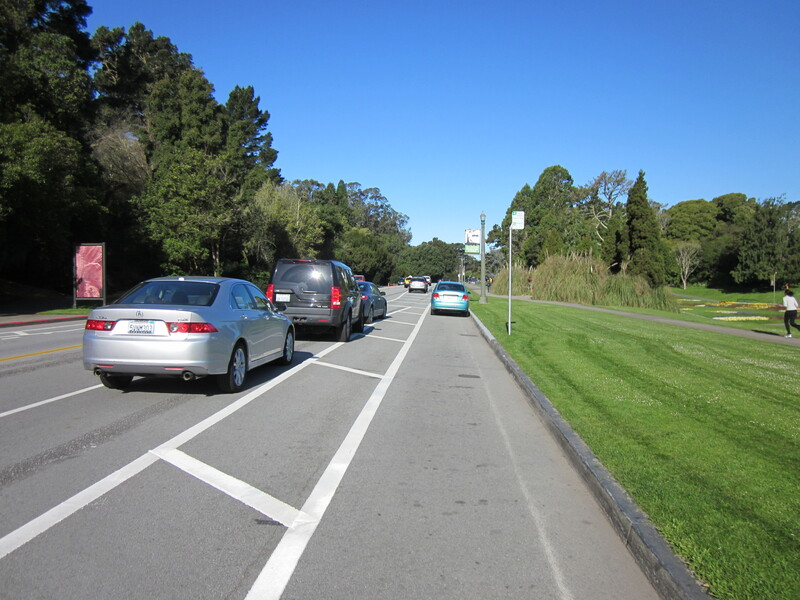 Recently San Francisco striped new separated bike lanes on JFK Drive in Golden Gate Park, which is a bicycle arterial through the western half of the city for commuters, including me. Thanks, San Francisco Bicycle Coalition! We take this route around the park with the kids on the weekends, but many more people take it east to the Panhandle on weekdays, and from there to the Wiggle and downtown. San Francisco is only 7×7 miles, so even people living at Ocean Beach can reasonably ride a bike all the way to work on this route, which is largely parkland, and now features protected bike lanes as well. The new striping put two-way car traffic in the center of the road, with a parking lane to the side of each car travel lane. Then there is a buffer zone for car doors (so awesome! 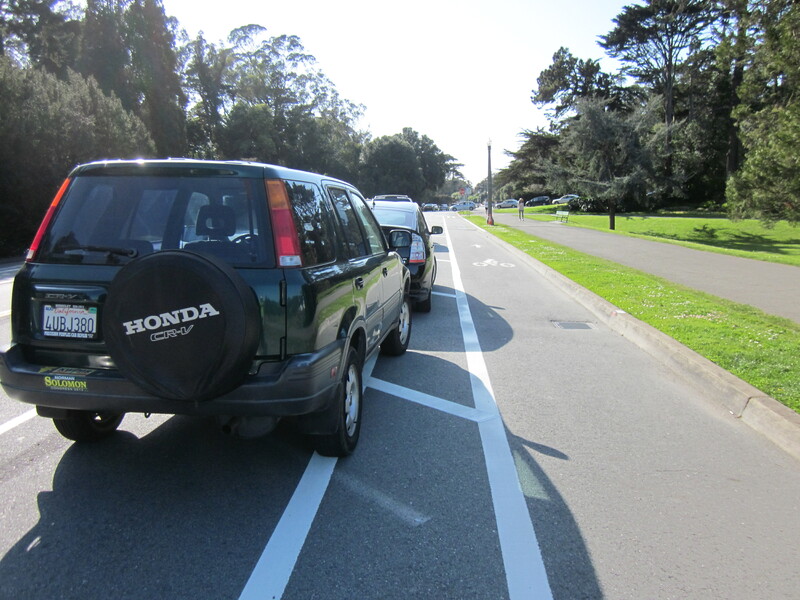 ), a constant risk in the park, and a bicycle lane on the right at the edge of the road. Figuring out the new system is apparently a struggle for some drivers. Although the bike lane is clearly marked, some people just can’t get over the idea of parking against the curb. This driver ignored all the cars appropriately parked in the strip to the left, not to mention an open parking space immediately to the left, in order to block the bike lane. It’s rare that I would advocate for a narrower bike lane, but maybe that might help this person get the point. 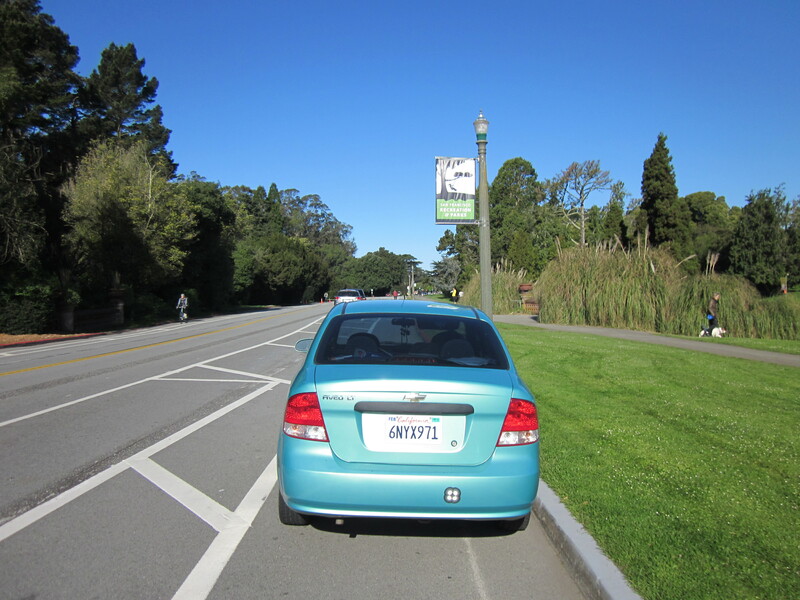 Maybe not, though, as the car is parked right on top of a bike lane marker (an oppressed bicycle). Still, having ridden these new lanes all week, I like them. Although I find it annoying that nearly all the cars park over the line so that they’re sitting in the door buffer zone to the right. Apparently drivers don’t really like being forced into moving car traffic when they’re stepping out of a parked car. The doorers now get to experience the consequences of dooring. Welcome to my world.